Zagster bike share provides 24/7 on-demand access to bikes on campus. All bicycles on campus must be registered. It’s fast, easy, and free. Sign up for one of our free bike education workshops. Learn about Penn State’s policies on riding and keeping bicycles on campus. There are many bicycle routes on and around campus catering to the avid bicyclist. It’s important to stay safe and keep your bicycle securely locked to designated bike racks. 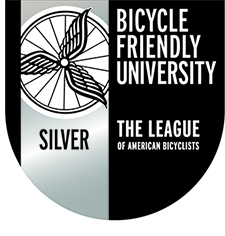 The League of American Bicyclists recognized Penn State University Park as a silver level Bicycle Friendly University.